Do you need to see 2003’s “The Room” before watching “The Disaster Artist” when it goes wide this weekend? Stars James Franco and Ari Graynor say, not necessarily. Graynor — who in “The Disaster Artist” plays Lisa, the actress playing Wiseau’s fiancee in “The Room” — agreed: “I don’t think you need to. ‘The Disaster Artist’ operates on two levels: if you’ve seen ‘The Room,’ it’s a love letter to the film and a scavenger hunt for fans. If you haven’t, it’s a movie about big dreamers and making your art no matter what people think. “It’s a win-win either way. But if you haven’t seen it before, you will definitely want to see it after,” she added. “The Disaster Artist” chronicles the making of “The Room,” which has been described in pop culture as the worst movie ever made. Wiseau and his friend Greg Sestero form a friendship and move to Hollywood to make their dreams come true. 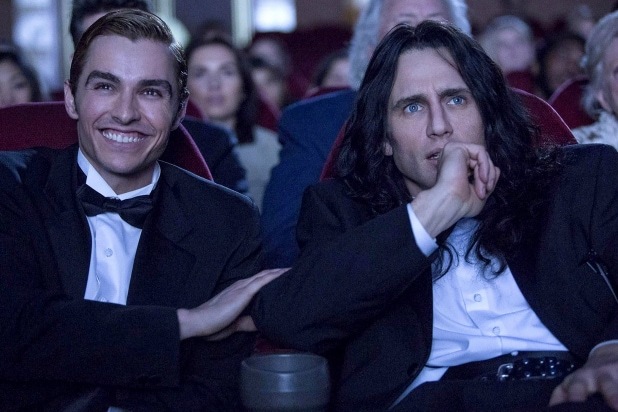 Franco’s brother, Dave Franco, stars as Sestero, while “The Disaster Artist” also stars Seth Rogen, Alison Brie, Zac Efron, Paul Sheer, Josh Hutcherson and Jacki Weaver. The movie, while it has its funny moments, also conveys a deeper message: that everyone should follow their dreams no matter who or what stands in the way. “The Disaster Artist” opened in limited theaters last week and is expanding to 800 theaters this weekend.